If making cotton look more interesting is what you do, then get your chosen weapons sharpened, dusted, polished or refilled, because it’s time for another RedBubble/Demo T-Shirt Challenge Extravaganza. We’re giving you the chance to have your t-shirt designs hanging in London’s illustrious Carnaby Street district, thanks to the excellent people at Demo. This time the theme is Music Machines, which should give your neurons plenty of creative space to play. We’re thinking steampunk pianos, cassette tape caravans, trombone tributes and vinyl dinosaurs. Basically anything involving a musical tool, weapon or instrument. You’ve got two weeks. Ready? Go. It’s just got to fulfill the theme and damn well rock. It’d be good if it was a new design as well. Demo like freshness. The community will pick the top 20 entries using the challenge voting system then the good folks at Demo will take over judging duties and pick their top five winners. Entry is open to clothing works only. If you can’t wear it, it’s not coming in. Entry is open to all members of RedBubble. If you are not already a member of RedBubble then join now to enter. Only one colour and style version of the shirt, and a cross section of sizes, will be purchased and made available in the store, therefore we recommend designing specifically to suit one colour shirt and style. One entry per person. No changes can be made to the design once voting commences. The five winners will have 20 of their winning shirts purchased from them at a markup of 30%, and will have their tees displayed in the store for two weeks with rotated window and indoor feature spots, for all the passers by to feast their peepers on. All your artist details will be included and advertised with the shirts so shoppers can read all about you. We’ll also post about the occasion with photos and a write up on RedBubble. If you are new to RedBubble, you just need to sign up then upload your design to your portfolio and then you can enter it into this challenge. If you need help go to the FAQs. Artists and writers retain copyright of any work entered. RedBubble will purchase the shirts at the agreed markup and provide them to the store. Demo will place their standard margin on the shirts to cover the cost of the retail environment. No profit will be made by RedBubble. You can find out more info about the store here. 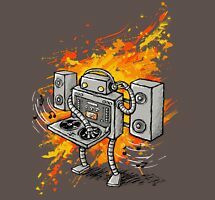 Robot DJ is in the House! by Ine Spee was voted the most popular entry in this challenge with 66 votes.